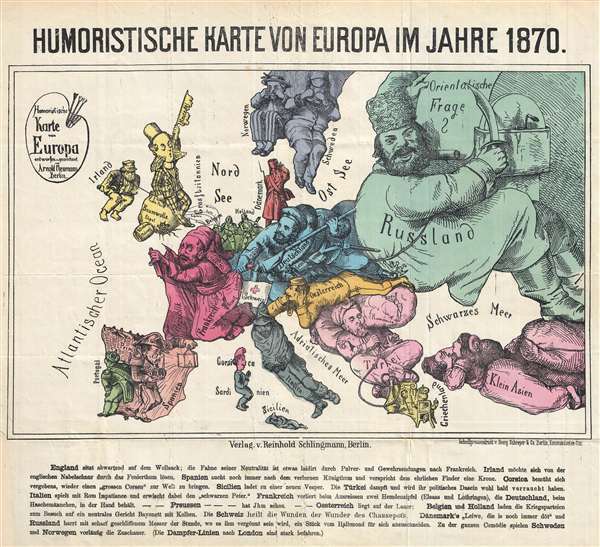 Extremely rare German satirical map of Europe. Ireland is being held on a string by England, and hopes to one day sever those ties. Corsica homes one day to again give birth to a 'Great Corsican'. The following is a transcription of the German text. This map was drafted and drawn by Arnold Neumann, Berlin and published by Reinhold Schlingmann, Berlin. We could find very few examples of this map in institutional collections and no other examples currently on the market. Very good. Minor wear along original fold lines. Blank on verso. Lower left margin extended.